I had heard “Beneath Your Beautiful” by Labrinth and Emeli Sandé in passing prior to listening to it closely for the first time yesterday. In small pieces of the song, I was able to recognize a pleasant piano piece mixed with a melodious vocal…and that’s about it. While I am partially ashamed to admit it, my first true listen to the song came at the behest of the America’s Got Talent results show on Wednesday night – and, ironically as it is, the musicians who performed it on the show were (and still very much are) from the UK. 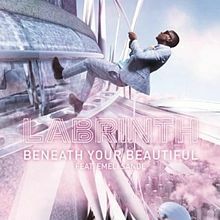 “Beneath Your Beautiful” is the sixth single released from Labrinth’s debut album Electronic Earth. Labrinth is the stage name of English singer-songwriter Timothy McKenzie. While proficient in numerous instruments and keen to a R&B/Pop sound, Labrinth’s debut release focused much attention to a unique electronica blend. “Beneath Your Beautiful,” which features the wonderful voice of Emeli Sandé – a Scottish recording artist – is a more traditional piano ballad, although it does feature some well-placed electronic elements. To be honest, this song has so many elements that strike a chord with me. Yes, I just went there with a terrible music joke! The opening piano riff is candid and simple. It is unbridled musical pulchritude (I’m a sucker for piano, I know). Labrinth’s vocal features a contained emotionality that is refreshing. The man has a tremendous voice, and he is not afraid to use his pipes when the time is right. But, while the voice is excellent, it is tender, and this helps establish its candor. The song adds strings and percussion when Sandé begins to sing, and she carries the verse perfectly. The harmony established by both voices is dulcet. It’s one hell of a song. And…apparently more than 50 million people agree on YouTube. Note: The grammar mistake in the title was a jab at grammar nuts by Labrinth – or just a sneaky way of covering up a mistake – :). Initially, I took it to mean that the singer wants to see beneath the beautiful (metaphorically) and into the soul of his/her lover (I’m cheeky like that).